I’ve recently been looking at building instruments using a 3D printer. I’ve been playing the guitar for over 40 years but most of the builds for 3D printed guitars seemed a little daunting as a place to start. I found a couple of 3D printed ukuleles that looked like quicker one day builds. 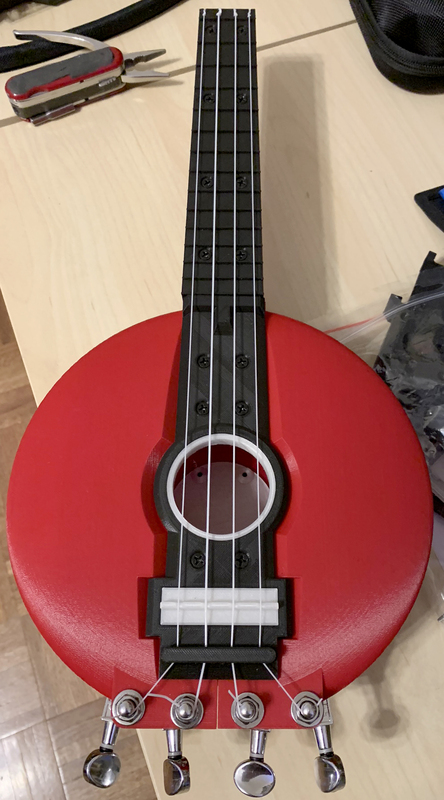 I finally settled on chuckbobuck’s soprano ukulele found on Thingiverse. I built a few to get started and found that instead of the friction tuning pegs used for his design, I wanted geared tuners. I originally used a drill to widen the mount points for the geared tuners, but that weakened the mount points. Once I had decided on the size of the new holes, I modified the left and right ukulele halves with larger, reinforced mounting holes. I have liked the original design, download those STLS, and then I linked my modified parts. The parts list and STLs are linked below.